Long time, no talk. It's been a little over a year since I stopped writing Latest Developments, and while I miss that at times, I'm also really excited about other parts of my job that include working on awesome sets like Ravnica Allegiance. As someone who has loved Ravnica since well before I got into the building, it was an incredible honor to be able to lead a Ravnica set and work with so many other talented designers to bring the guilds to life. Plus, I got to lead the set with Rakdos, the greatest of all the guilds! But this article is about a lot more than just that, it's a little vision into what it took to put the entire set together, focusing on the guild mechanics and play patterns. The task of following Guilds of Ravnica included a lot of challenges, but also a lot of benefits. The two sets were built very much in concert with each other, something that I give a lot of credit to Erik Lauer for spearheading, and for giving me a really great starting point for the set. The biggest benefit is that I could take much of Ravnica Allegiance's structure from the format that Guilds of Ravnica laid out. The largest challenge came from the fact that I needed to take much of the set's structure from the format that Guilds of Ravnica laid out. A real double-edged sword! Luckily, Guilds of Ravnica's cycles were very good, and you will see a lot of them return in Ravnica Allegiance. Luckily, there was also a lot of room for additional cycles beyond just those, and individual card designs. Deciding on guild mechanics for a set on Ravnica is a little different than how we decide mechanics for a regular Magic set. The biggest advantage is that because the mechanic will only be in two colors, and only over a limited number of cards, you can use mechanics that are not super deep. In a regular set, if your mechanic only has about eight different designs, that's a real problem—but that could be the perfect number for a guild set. On the other hand, the need for very regimented overlap between the guild mechanics to make specific three-color decks and monocolor cards play with either guild's strategy adds a lot of challenges. That often means that you can find one mechanic that is cool, but just doesn't overlap well with other guilds. During vision and early set design, we had a mechanic called debt that worked great flavorfully for Orzhov, where you would give your opponent counters that they would have to pay off with mana, or else take damage every turn. We tried out many variations with how much they cost to pay off and how many counters you would give to your opponent. We struggled with two things: the most basic was finding numbers that worked for overlapping with both Rakdos and Azorius. Generally, if we got the mechanic right for the Orzhov deck, it would usually be useless in one guild and too strong in the other. While the mechanic had some struggles by itself, it was ultimately the fact that it didn't overlap with its neighbor guilds that kept us from using it. Luckily, we did manage to find mechanics that fit all of these requirements and ended up allowing for the depth of gameplay we were looking for. The nice thing about getting these two decks to overlap is that Rakdos, outside of just aggressive creatures, tends to like to sacrifice things and has lots of removal. Orzhov shares those exact same parts of its identity, so we needed mechanics that could play that up. Afterlife is the real glue between the two, where you can have creatures that die become evasive 1/1s, which help the Rakdos deck turn on its spectacle for either one big turn, or (later in the game) play some of the cards with higher spectacle costs than their regular mana costs, but with an additional effect. These were the two most aggressive guilds in Ravnica Allegiance, so, naturally, their overlap wanted to somehow be in aggressive decks. Rakdos's mechanic of spectacle actually started out as the Gruul mechanic, but we really struggled to make the card designs not feel derivative of raid or bloodthirst. A big problem was that green just didn't have a lot of effects you realistically want to cast after combat, but it was much easier to find those in black. That led us to swapping the colors, and I believe that really let us make much more fun cards. One of the biggest questions about riot was how often you would really choose the haste over a +1/+1 counter. One way to incentivize just that was to give red decks the opportunity to get unexpectedly explosive turns by playing a creature with riot (sometimes with an attack trigger), choosing haste, then playing a spectacle card after combat. Zoom! This is the guild pair with probably the most obvious and mechanical overlap. Simic cares about +1/+1 counters. Like, a lot. Both of its previous mechanics, graft and evolve, used them. That meant the easier way to get the guilds to overlap was to tie Gruul's mechanic into +1/+1 counters. This meant we could easily make cards that interacted or cared about +1/+1 counters, and you could easily get those on your Gruul creatures by just choosing the +1/+1 counter over the haste bonus. Considering Simic is a bit of a slower deck, that also lined up well into what it's normal play pattern would be, and plays well into the part of Gruul that is all about big creatures. In this version of Ravnica, often the Simic part of the overlap are cheap creatures that can grow later in the game, and the Gruul part is just having some top-end fatties. Azorius was where we struggled the most to find meaningful mechanical overlap and the correct mechanic for the set. 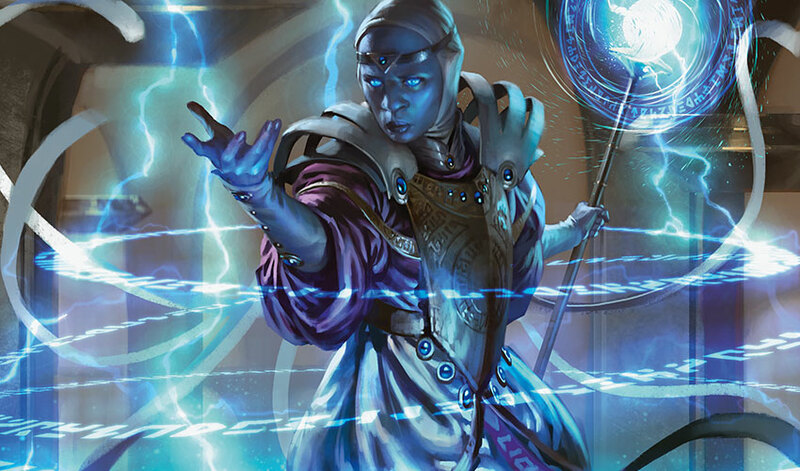 Part of the problem is there are lots of white-blue mechanics that are fun, but very few mechanics that fit into what the Azorius Senate is doing creatively while also being enjoyable. Our many explorations into mechanics that felt like top-down red tape reminded us a little bit too much of the worst parts of going to the DMV. The ultimate goal for the Azorius mechanic was something that played well with Simic's versatility in paying adapt costs, and Orzhov's attrition gameplay—all while playing into what the white-blue overlap in the color pie did well, and still having a creative identity that made sense. What we decided on was addendum, playing off the flavor of Azorius trying to control the pace of the game's play, and getting an advantage when it could play its spells at sorcery speed, while having the options of doing it at instant to leave its options open. One of the first cards I knew we would be able to design was a strong card-drawing spell that might be able to have a shot at Constructed. That meant having it default to instant, but giving it some extra juice if you either need to dig for something during your main phase or you already have the extra mana open to hold up a counterspell. Let me present you with Precognitive Perception. Once we had a handle on what the mechanic was for Azorius, it was just about figuring out how to make it work with the other guilds. Orzhov's afterlife has two main skills: one is creating fodder for sacrifice, but the other is letting you block a lot over multiple turns. For the overlap here, we wanted to take advantage of the fact that creatures with afterlife will frequently put you in a position where you don't need to hold up a removal spell or trick to ensure that you will be able to block and survive on the next turn, letting you get the most out of your addendum bonuses. As an added benefit, white-blue are the colors with the most fliers, so you will often end up with creatures that don't exactly end the game quickly, but do it at the kind of pace at which Azorius likes to play. Simic, on the other hand, plays into the versatile nature of addendum. Monstrosity costs in Theros tended to be very high, because they were on very large creatures. Here, because the creatures started off smaller, we had more options for smaller or medium adapt costs. 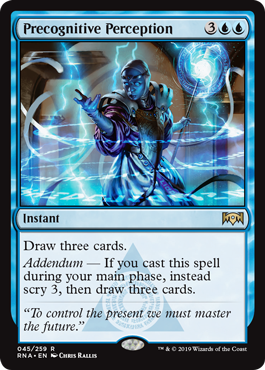 It also meant that during more of the game, you could hold up an addendum card that had reactive properties or an adapt creature with a triggered ability, and get to see which one you actually wanted to play. Instead of necessarily planning your game out multiple turns ahead, you get to think on the fly and react to what your opponent is doing with the best possible play. I'm really proud of all the work that people on my Set Design team and the various people throughout Wizards of the Coast put into making Ravnica Allegiance a reality, and hope you all will too when you get to play the set yourself at Prerelease, January 19–20!